It's been said that cider is the best beverage to pair with cheese. We like to test this theory every chance we get. Our Chef and Culinary Director Missy Corey put together some cheeses that pair well with Michigan Brut, and we had a chance to try them in our cider house. "Overall Michigan Brut works nicely with a semi-firm cheese that has a touch of sweetness like a Gouda, Gruyere, or Cheddar," she said. Michigan Brut is a tart, apple-forward dry cider with a a crisp finish. We look to pair chese with these qualities of the cider. Michigan Brut's crisp finish and tartness pair well with nutty flavors in the semi-firm cheese. The apple-forward aroma of Michigan Brut works great with triple-cream cheeses. 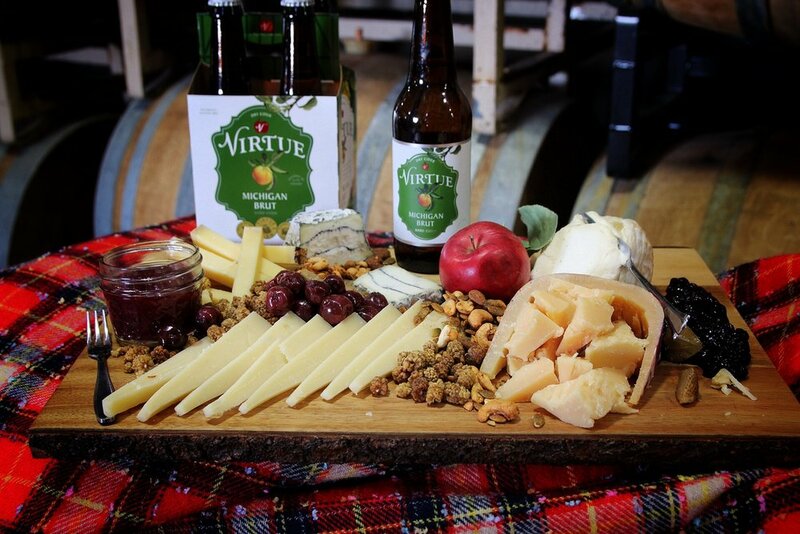 Sample cheeses from a selection of the above producers at our Aug. 20 Cheese, Tapas & Cider Pairing event at Virtue Farm. Proceeds from this event will benefit Slow Food West Michigan.